Brent Young has a BA honours in Biochemistry and Molecular Biology (Dalhousie 2013), a Master’s in Pharmacology (Dalhousie 2015) and is currently enrolled at the Dalhousie Medical School (class of 2019). Brent is Anishinaabe, however he was born and raised in Cape Breton. Brent has enjoyed the enormous privilege of being the first in his family to attend university. Brent has always been a very active student contributing to several student groups and committees. His contributions to the Dalhousie community was recognized this year (2018) when he was the recipient of the Dalhousie Impact award, Certificate of Distinction, which is awarded to students who demonstrate above-average contributions to campus life over the course of a university career. Brent is also currently a Medical Student Researcher for the Dalhousie Department of Psychiatry and a research assistant at the IWK Centre for Pediatric Pain Research working on the nationally renowned Aboriginal Children’s’ Hurt and Healing Initiative. Brent recently attended the Walking Together: Indigenous Health Conference, here are his thoughts. My colleague, Samantha Leonard, and I recently had the opportunity to attend the Walking Together: Indigenous Health Conference at the University of Toronto. This was made possible by the Johnson Scholarship Foundation Travel Award for Indigenous Students and the Dorothy and Richard Payzant Ward Travel Award administered by the Dalhousie Medical Research Foundation. Because of this generosity, we were able to present our research and learn from other national leaders in the field of Indigenous Health in Mississauga between May 24th and 26th. I was fortunate enough to have been selected to deliver an oral presentation about my research that explores perceived racism and discrimination among Indigenous students studying at Canadian medical schools. My work was well received, and it garnered a lot of interest from healthcare decision-makers across the country. We also had the opportunity to hear from other leaders in our community such as Judy Da Silva, who is leading the charge against the Grassy Narrows mercury crisis, and Aluki Kotierk, who spoke about the barriers that Indigenous people face in the Canadian healthcare system. We attended a workshop hosted by the Ontario Indigenous Cultural Safety Program, where we learned about seven wise practices for the implementation of Indigenous-specific cultural safety training. I hope to carry these teachings forward in my career and in my future efforts to develop similar anti-racism programming in Mi’kma’ki. In addition to attending these formal sessions, I was also able to network with some of my colleagues and co-authors from other medical schools. I would like to take this final opportunity to express my sincere gratitude, as this would not have been made possible without the generosity of my supporters. Samantha Leonard has a BA Honours in Biochemistry from Dalhousie University class of 2014, and is currently enrolled at the Dalhousie Medical School (class of 2019). Samantha resides in Halifax Nova Scotia, but her family stems from Labrador. Samantha is very proud of her Inuit heritage and looks forward to using her education to help close the health services gap within Indigenous communities in Canada. In particular Samantha has been doing research into Indian Residential School and how the trauma suffered in the Institutions has had an intergenerational effect the mental and physical health of the Residential school Survivors and their descendants. Samantha is very honored to have been chosen as one of the recipients of the national Indspire scholarships awards for 3 years in a row (2015-2017). Samantha recently attended the Walking Together: Indigenous health Conference, here are her thoughts. My name is Samantha Leonard and I’m a Dalhousie Med 3 student. Med school at DAL has been going great so far, it’s been a major change going from the classroom to the wards but it’s been such fun. 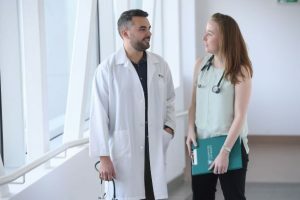 One of the things that makes Dalhousie Medical School unique is that we have to do a research project and prepare a presentation that is presentable to others at conferences. My research looks into how Indian Residential School continues to effect the physical health of Intergenerational Survivors. So when I saw the opportunity to attend and present at the Walking Together: Indigenous health conference put on by the University of Toronto I was excited. It was a great opportunity to have my hard work seen by other students and professionals interested in Indigenous health. It was also fantastic talking to all the different stakeholders in Indigenous medicine that attended the conference. I had a really interesting chat with one of the Air Ambulance pilots from the North West Territories which got me really excited for my own elective which will be taking place in Northern Canada. I really would really like thank the Johnson Scholarship foundation for their support in helping me realize this opportunity. I would also like to encourage others students to engage in Indigenous health research, you just have to find a knowledge gap that you can fill. Please visit our website to learn more about the Indigenous Health Program.